Telltale Games laid off a majority of its staff in September ahead of a full studio shutdown. That left well over 200 people without jobs and the studio’s latest project, The Walking Dead: The Final Season, in limbo halfway through its four-episode run. Now, reports from suggest that Telltale wants to finish the series with another studio using the original development team. The company officially said last week that “multiple potential partners have stepped forward to express interest in helping to see The Final Season through to completion.” That statement was met with a great deal of cynicism at the time, since former employees were let go without any sort of advanced notice or severance pay. But two anonymous sources tell Kotaku that Telltale hopes to partner with an outside studio to finish episodes three and four of the season, with former members of the development team working “on a contract basis” to bring out the end of the series. That could mean the entire development team, or it could mean a group as small as possible to get the game out the door. Whatever the case, it would be the partner company footing the bill for the remaining development, rather than Telltale acquiring funds that could be spent on severance. Those sources report that episode three is “essentially finished,” and four was already well into production when the studio closed. However, it seems negotiations are taking longer than Telltale had initially hoped. With affected employees scrambling to find new jobs, continued delays will mean fewer are available for contract work to finish the series. 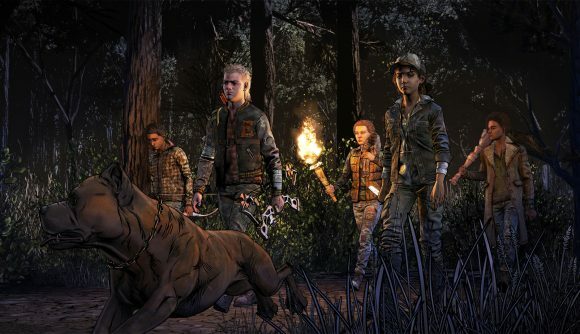 The Walking Dead: The Final Season was delisted last week, and it remains uncertain whether the series will ever come to a proper end. This proposed measure to bring out the last two episodes would at least give former employees a stopgap solution as they look for other work.